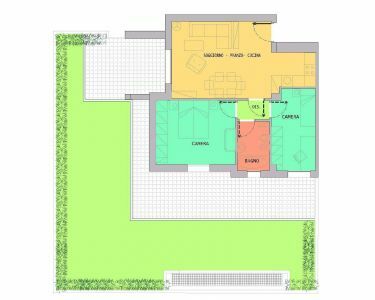 In a newly built building convenient to services in the Santa Croce area near the campovolo, availability of new apartments in class C on the ground floor with garden as follows: living-dining room with large porch, kitchenette, double bedroom, single bedroom, bathroom, cellar and garage in the basement. The property includes a large private garden of about 200sqm on two sides. The properties are equipped with a district heating system, ceramics of first choice over the entire surface. Possibility of additional garage. Sale direct from the property - NO expense of mediation. Possibility of buying real estate with income. Availability of additional new apartments and prompt delivery in class B on the 1st, 2nd, 3rd floor. Available for negotiation and to evaluate expressions of interest.